The Silver Economy is the name wich is used actually to definy the Senior market. It is also often referred to as the Seniors’ Market and covers all products and services intended for people aged over 60 years. More formally, “All products and services that are expected to improve disability-free life expectancy or to help dependent elderly people and their caregivers on a day-to-day basis”. The population lives and will live longer and probably healthier than our elders. It is in particular the demographic consequence of a better quality of life and health for our fellow citizens who invites us to build a new vision of the future in which old age will not be a social handicap nor a factor of exclusion. “We have gone from wanting to live as long as possible, to living as long as possible in good health and young seniors ask to live as long as possible to continue their activities,” explains Frédéric Serrière. Therefore, our society must adapt to allow everyone to benefit from this formidable progress in the best social, economic and health conditions possible. Aging is everyone’s business. In 2015, it can be seen that the Silver Economy is very closely related to what we call the sector of the old age. That is, business lines such as home maintenance, health, housing, personal services, and so on. 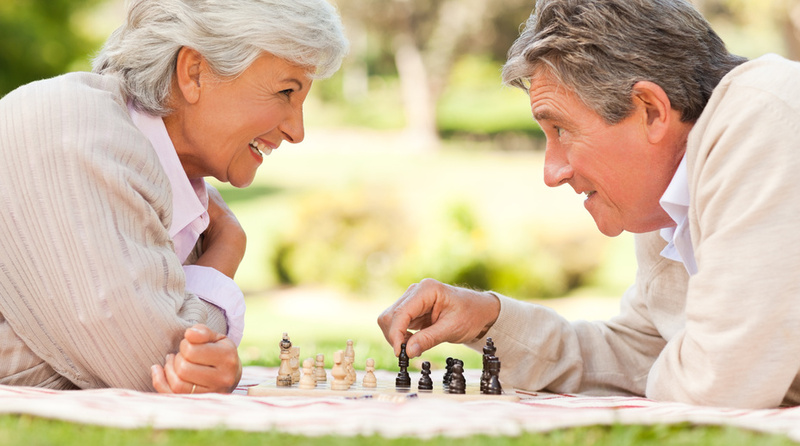 Thus, the Silver Economy is often reduced to an area of activities, certainly important, but that could be even more so if Silver Economy was defined by the concept of the market of Seniors. That is, the activities and consumption of all retirees, whether for products specifically dedicated to them or products for all generations and also consumed by retirees. Some will explain that this is already the case, but the topics discussed in conferences and other events on the Silver Economy in France seem to reverse this view. Thus, two visions are currently confronting regarding the perimeter of the Silver Economy. On the one hand, the Silver economy limited to the sector of the great age and thus to the Seniors the oldest. This is, in a sense, the field of the law on the aging of society that has just been voted. On the other hand, a Silver Economy is more ingrained on the market of the seniors. The difference is size. With the first definition, the market is relatively small as we will see in this guide. With the second definition, the market is a genuine growth relay for companies because it concerns not only the elderly Seniors, but also the seniors retired autonomous and more consumers. In 2016, Frederic Serriere Consulting defined the Silver Economy market at 92 billion euros (6), with the following definition: products and services designed for seniors and consumed by seniors (60 years and over) Excluding the health costs of the last 6 months of life. This figure is expected to increase to 130 billion euros in 2020. 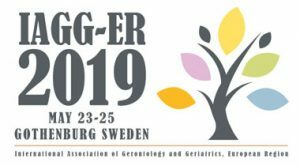 Beyond the Silver Economy and the Seniors market, there is the notion of demographic aging, which the Anglo-Saxons call the global aging and more recently the global ageless society. The McKinsey company published a study in April 2016 explaining the increase in consumption that we will be experiencing by 2030. This increase will be achieved by urban consumers at 90%. 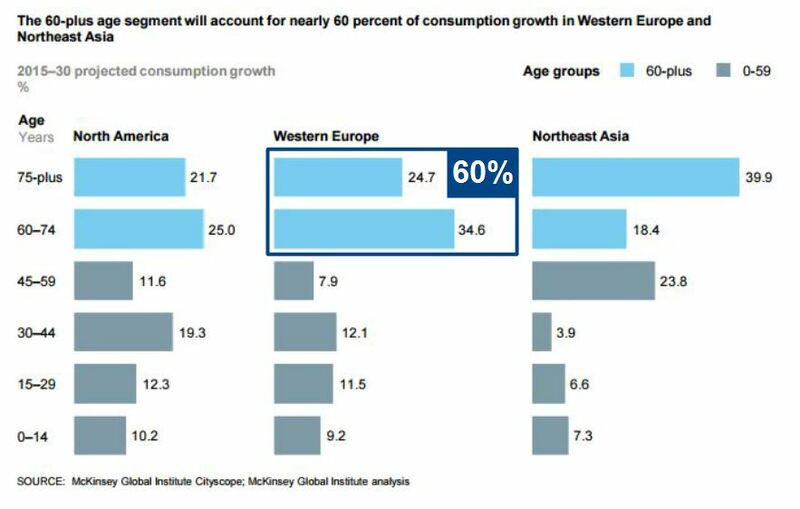 In Western Europe, those aged 60 and over (1) are expected to generate more than 60% of the increase in consumption by 2030. Not to mention, of course, their current high consumption. Not all businesses are affected by the Seniors market. On the other hand, most are concerned with demographic aging. That is to say, the raising of the median age of all citizens and the increase in the number of generations. For example, large distributors such as Carrefour and Auchan have no interest in developing specific businesses for Seniors, but have to adapt to more generations of customers while taking into account the needs of each Among them, including the elderly. The Silver Economy is often presented as the economy of aging. However, in practice, it is the use of products and services for the elderly. The market for seniors is defined by the overall consumption of over 60 years, whether for products specifically dedicated or common products used also by other generations. 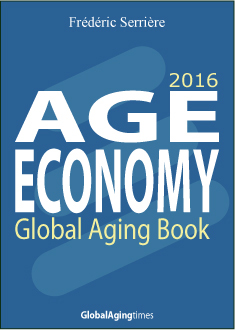 Finally, demographic aging is a subject that is more global and impacts a greater number of actors and enterprises. 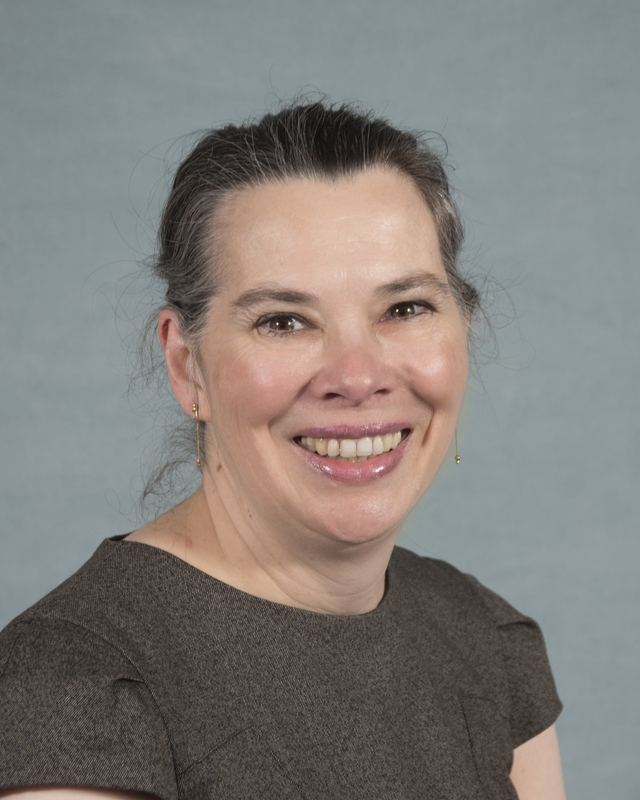 For example, if retailers have no interest in developing specific stores for seniors (a failure has already taken place in Austria with Adeg 50 plus), its challenge is to adapt to the impacts of demographic aging. For example, adapting not only businesses to Seniors but, above all, developing places that are adapted to a greater number of generations with expectations that can vary. The development of the Silver Economy is greatly impacted by the criteria that structure it. This is why many Silver Economy companies are struggling to grow and achieve their goals. Among these structuring facts, there is the almost absence of prevention in the culture of the Latin countries like France. This is of vital importance in Silver Economy markets, such as home furnishings: elderly people tend to adapt their homes by fitting the bathroom, installing a staircase or safety systems, etc. only after A first incident, often a fall. With this lack of prevention linked to a probable future dependency, the Seniors are rarely equipped in a preventive way. This greatly reduces potential markets for companies in this sector. Another structuring criterion is demography: the serious study of a French age pyramid indicates that we will see a relatively small increase in the number of people aged 77 and over in the next 6 to 8 years. This phenomenon is mainly due to the lack of births during the Second World War. It was only after the Second World War in 1946 that the boom of births took place with a generation we call the baby boomers. But the older ones of this generation have “only” 70 years. It is also for this reason that the number of dependents has been virtually stable for seven years and will continue to be for five to six years. It is also, in part for this reason, that the number of buildings for retirement homes is extremely low. Investors preferring to invest more in senior residences, a sector that particularly concerns younger seniors. As a result, companies that are positioned in markets linked to people aged over 77 years are in sectors with fairly limited potential in the short term. Due to this demographics, a large number of areas of the Silver Economy, such as home maintenance, will only take real flight after 2022 see 2025. The demographic aging structurally impacts some sectors of activity on the rise or fall. For example, as people get older, they become progressively less mobile and spend more time at home, which will lead to a structural decrease in their consumption of clothes and transport, but will increase other sectors such as electricity consumption , Indoor equipment, security solutions and media consumption. Conversely, business lines are structurally declining with demographic aging for another reason: studies indicate that Seniors tend to purchase equipment goods such as more high-end household appliances with more Options, but tend to renew them less often. This phenomenon coupled with the fact that seniors are the most equipped generations of goods and services, will tend to downward certain sectors such as household appliances or the automobile. Business sectors will benefit from the demographic aging and the Seniors market in a way spread over the 10, 15 or 20 next years according to different parameters and according to the evolution of the demography. Before 2022, it is especially the areas of comfort and well-being, of discovery in tourism: these activities that target seniors who are going to be rising sharply. Then, after 2025, sectors linked to the elderly, such as home improvement, security technologies, etc. Will also take off with the arrival of baby boomers at great ages. Thus, the sectors of activity that can have a strong potential in the very short term are numerous: tourism and leisure tailor-made for senior citizens, effective solutions for caregivers, financial products for senior citizens but also everything Which can automate transport such as stand-alone car etc. With the demographic aging, a paradigm shift is taking place: we have moved from the desire to “live as long as possible” to “live as long as possible in good health”, now “wanting to live the most Long time in good health to do “activities, to live experiences or continue his leisure. During the study, a 65-year-old Boomer explained that he was boxing with his son and that he wanted to continue but that physically he was starting to have more difficulties. “I want to continue to do boxing in the next few years and continue my activities.” To meet this demand, the potential for innovation is enormous. Of course, there are demands for mobility, keeping fit, or even simplifying activities like boxing, our example. This will to continue its activities and to be mobile will develop in the very short term new markets like that of the autonomous car or flexible exoskeletons that will help the person to move to continue to be in the Company.